Plasma Descumming: This procedure is used to remove thin residual layers of photoresist areas following photoresist development. These residual films are typically less than 1,000 Angstroms thick, but can interfere significantly in resolving the pattern during etching, especially if the pattern geometries are small (such as contact windows). A plasma descumming can generally remove these residues in less than a minute. The wafers or substrate is loaded into the reactor chamber, and a plasma is established by using oxygen. Some people add 4% CF4 if the resist is difficult to remove. A plasma is established for the appropriate time, usually about one minute and the system is vented to atmosphere. The wafers or sample is now ready for etching. Good uniformity is required for this process. The AutoGlow 200 is recomended for this applicaiton–a single wafer system that can accomidate up to a 200 mm wafer or square substrate and has both plasma or RIE configurations. A shower-head gas distribution option is suggested for imporved uniformity. 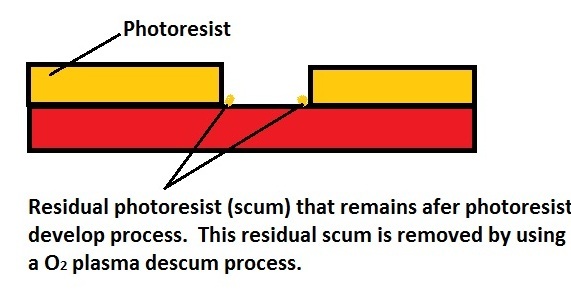 The descumming process itself demands stringent control be maintained so as not to adversely affect the integrity of the photoresist layer or alter the pattern quality. Serious degradation in the uniformity of etching can result.